‘Divided Society’ is a unique and important resource that explores a critical time in Northern Ireland’s history. Since the late 1960s the Linen Hall Library in Belfast has been collecting material relating to the conflict in Northern Ireland. 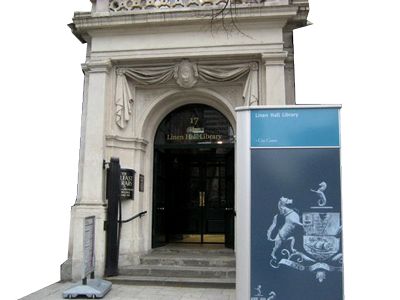 Over the years the Library has become the repository for a huge amount of material relating to the subject and the subsequent peace process. 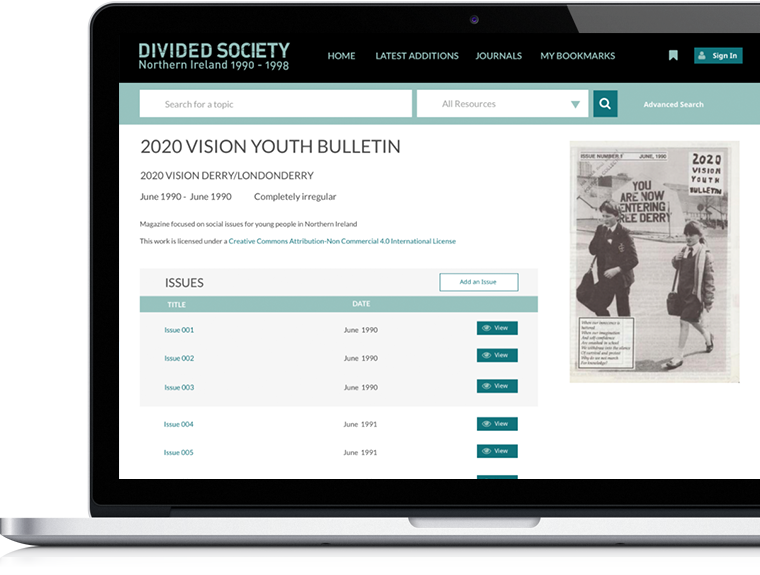 The ‘Divided Society’ project has digitised and catalogued a significant section of the Northern Ireland Political Collection. Over 500 periodical titles relating to the conflict and peace process have been made available to search and consult. These are publications that were published between 1990–1998 in the UK, Ireland and further afield, and documented the issues that affected Northern Ireland during that period. 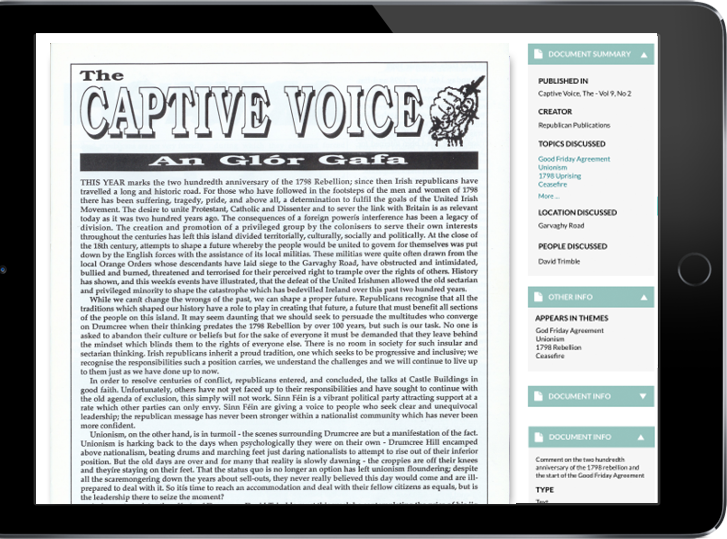 The publications come from a variety of perspectives including community groups, voluntary groups, political parties, pressure groups, local and national government, and paramilitaries. Over eight hundred political posters have also been digitised. Education and Outreach was an important part of the project. This included an intergenerational reminiscence project involving community groups discussing the conflict alongside students from schools and Universities. Audio recordings from this work are available in the Outreach section along with six education toolkits. Two exhibitions were commissioned and are available to exhibit in other spaces. The first, We Lived It – the Social Impact of the Troubles, uses material from the Collection and personal stories gathered during the project. The second, Laughter in the Dark – Illustrating the Troubles, examines how political cartoons were used to depict, explain and challenge the conflict.